Houghton Mifflin Harcourt, 9780544047747, 256pp. For fans of Meg Wolitzer and Allegra Goodman, an intimate and provocative novel about three couples whose paths intersect in their New York City neighborhood, forcing them all to weigh the comfort of stability against the costs of change. Nina is a harried young mother who spends her evenings spying on the older couple across the street through her son’s Fisher-Price binoculars. She is drawn to their quiet contentment—reading on the couch, massaging each other’s feet—so unlike her own lonely, chaotic world of nursing and soothing and simply getting by. One night, through that same window, she spies a young couple in the throes of passion. Who are these people, and what happened to her symbol of domestic bliss? In the coming weeks, Nina encounters the older couple, Leon and Claudia, their daughter Emma and her fiancé, and many others on the streets of her Upper West Side neighborhood, eroding the safe distance of her secret vigils. Soon anonymity gives way to different—and sometimes dangerous—forms of intimacy, and Nina and her neighbors each begin to question their own paths. 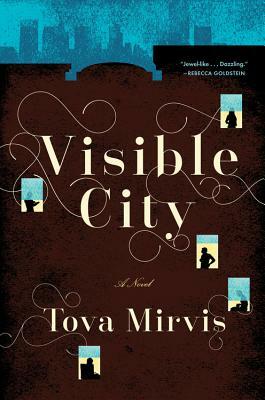 With enormous empathy and a keen observational eye, Tova Mirvis introduces a constellation of characters we all know: twenty-somethings unsure about commitments they haven’t yet made; thirty-somethings unsure about the ones they have; and sixty-somethings whose empty nest causes all sorts of doubt. Visible City invites us to examine those all-important forks in the road, and the conflict between desire and loyalty. “At night, Nina went outside and looked at the houses beyond the fence. From here it was hard to know what really went on in people’s lives ” (p. 135). Nina has a history of curiosity. What draws her to other people’s stories? Do you think this type of curiosity will continue? Sooner or later, someone would always know. Fifty blocks from home or five hundred, privacy was generally an illusion ” (p. 154). Why does Leon think this? Do you thinkprivacy is an illusion? Considering certain current events surrounding privacy online and the NSA’s intrusion on citizen’s privacy, how do you perceive privacy now? How do you keep your private life private? “How wrong she had been to thin k she could gaze out unaffected ” (p. 177). How does watching other people change Nina? “Why for so many years had she tucked away the feeling that she was invisible?” (p. 205). Why does Claudia feel invisible? What does Claudia hide from those around her, and what does she only think she hides? How does this affect her relationships with those she loves? Do any of the other characters do this as well? In this book, change is necessary, liberating, but it can also be a betrayal — not just for the characters, but also for the neighborhood itself. Why is it sometimes easier to orbit around the lives of others than to inhabit the center of one’s own world? Also, when we make permanent situations that are based on only partial truths, what happens when other truths start clamoring for recognition? When Nina visits Leon’s apartment, he says "we're much closer" (p. 137) to the construction. To Max the building going up is a source of endless fascination; to Claudia it is an appalling nuisance. Leon welcomes it even as he recognizes what it will mean for the status quo. Jeremy's relationship to it is at first much more practical and hands on and of course undergoes the most radical shift. What does each character’s reaction to the new construction reveal about himself or herself? Visible City is full of forbidden spaces, from Jeremy’s explorations to Emma’s story of the night zoo and Nina and Leon’s relationship. What draws the characters to these spaces? Explore why Claudia loves the art of stained glass. What does it say about her character? How are several of the characters trapped by their narrowing paths? Is it possible for them to integrate the many sides of themselves? And how does this challenge relate to the lure of new romance, the temptation to believe in the possibility of unearthing a hidden masterpiece? “The prospect of concealing scared her as much as revealing. Would she rather stay hidden or be found?” (p. 239). Discuss the nature of secrets. What is the allure of a secret? Is it possible for a secret to stay a secret? Or is it human nature to want to both discover and be discovered? How is the perception Nina has of Claudia and Leon’s relationship from watching them through the window incorrect? What does this say about how much we can know otherpeople without talking to them? At what point do you really know another person? Discuss Nina’s transformation as a mother. Why does she have trouble relating to the other mothers in her neighborhood? Are the other mothers as united as she perceives them to be? What sort of commentary do these various parents offer on contemporary child-rearing philosophies? Claudia, Nina, and Emma represent three different generations of women, all at a crossroads with their partners. What are some of the different issues they face as women? And what similar struggles do they face? Do you think their outcomes are remarkable or inevitable? Do you think the three couples’ stages of life factor in to what they ultimately decide? Consider the title of the book. How much of the book is about what can be seen versus what can’t be seen? What are some of the invisible things it explores?